I live in Arizona. Not much grows here. If it does, it’s because there are some amazing plants that can survive the 115 degree summer that sometimes even I don’t think I can live through. They do it though! I’m from North Carolina – where everything grows. As long as you can dig through the red clay and get some rich soil in your garden you’ll be set. One year we grew so much zucchini that we ended up giving a few to the UPS guy! This is the first time I’ve tried gardening in a different climate and since I’m not fond of straight up killing things – I decided to start small. This is a grouping of three different succulents that I bought about three months ago from Lowe’s. They need water about once a week and partial sun if they’re outside. They’re super easy to take care of and exactly the kinda of plant a new Arizona gardener should start off with. About a month and a half ago I ventured into more real gardening and ended up with a beautiful little patio tomato plant. Look! I have one tomato! It’s my little baby…and probably the only one I’ll get. When I first saw it at about the size of a blueberry I got super excited and wanted to Instagram it — but figured that might be a little pathetic. So I guess I waited until now when it’s a little larger than a cherry tomato! Right now isn’t the best time for tomatoes in Arizona, the heat is getting to be too much for it. It typically needs full sun but when I had it out in the morning sun the leaves started to wrinkle up. 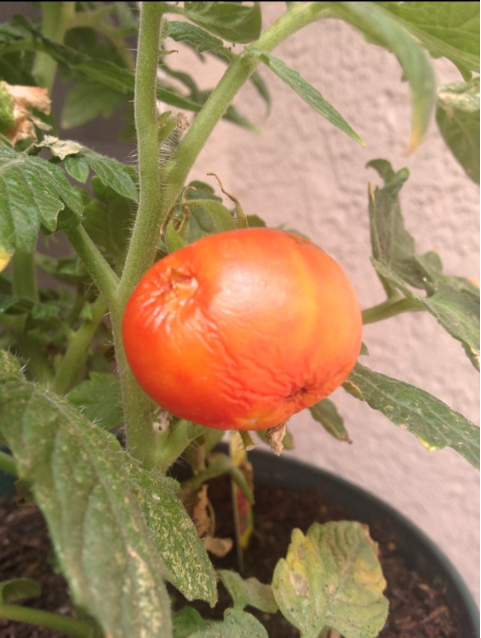 I have it out of the sun now – mostly just hoping that I can get this ONE tomato to turn red and then “harvest” it and start earlier next year. I’ve had a lot of fun keeping up with my little plants and even came up with a DIY project to go along with it! See that wine bottle? It’s my watering can 🙂 I got it out of the recycling of the family I nanny for and decided it would make the perfect watering can. I got a drawer pull from Hobby Lobby ($2) and super glued the ends to some cotton fabric and attached that to the bottle. I’ve been using it for about a month and it’s working like a dream! When I get a real garden I’ll invest in a bigger (and real) watering can but for now, it works!